Despite its other-worldly look, this is one hardy creature, like a cross between a fruit fly and a worm, and hundreds of species are in their family tree, Ecdysozoa superphylum. The tardigrade thrives in areas that other animals would find as a hardship. This protostome (“first mouth") invertebrate is on all continents from the Arctic to the Antarctic and lives everywhere from mountains to the lowest sea. They frequent water, but they love to stay on lichen or moss. Not only can tardigrades take on different climes, but they can survive an extended trip in the cold and have withstood the irradiated (meaning: subjected to radiation), vacuum of outer space! In fact, in 2007, the Italian Space Agency, ASI, put living tardigrades on an experimental trip called BIOKIS (BIOKon In Space), to evaluate certain living species and how space travel would affect them. The tardigrades didn’t have cabin seats either but rode on the outside of a FOTON-M3 rocket for ten days. The investigation was typically looking for news in the areas of cellular biology, aging, plant growth and radiation protection. When the flight was over, researchers found that 68 percent of the tardigrades lived through the tenacious trial. “Our principle finding is that the space vacuum, which entails extreme dehydration and cosmic radiation, were not a problem for water bears," says TARDIS project leader Ingemar Jönsson, from the University of Kristianstad in Sweden. 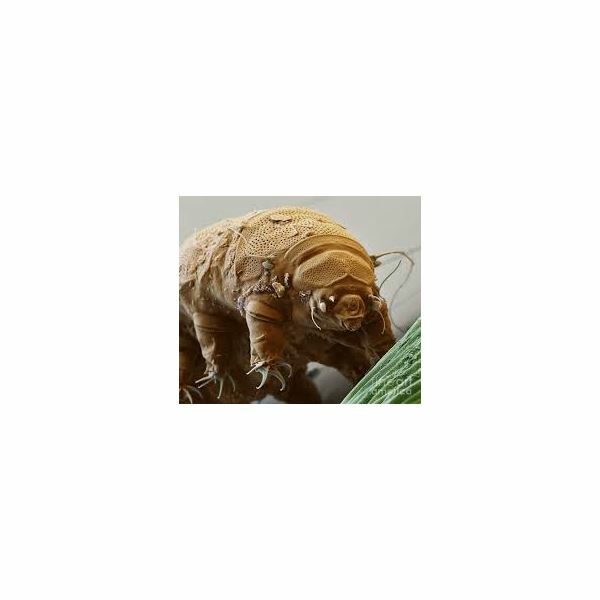 Tardigrades are amenable to extreme temperature and negative-water situations because they can suspend their metabolism into an almost death-like state called, cryptobiosis. Scientists have studied this in the tardigrades and refer to the next period as anhydrobiosis. Don’t let the words throw you. It means they contract their bodies into something called a tun, so the tardigrade shrivels up, folding in on itself, losing more than 95 percent of its water. It dehydrates itself. Then, inside the little creature, a process goes on to build up proteins and sugars and produces antioxidants, which help to protect its cells like a type of wax extrusion. Next, when conditions are more favorable, like when there is more water available, the animal turns up its metabolism, rehydrates and grows to its normal size again. The interesting part of this is the tardigrade can stay in a state of anhydrobiosis for an extended period. According to the European Space Agency (esa), these animals shrug off temperatures of minus 272 Celsius, one degree warmer than absolute zero. And other species can endure powerful radiation and the oxygen-deprived vacuum of space, surviving on the outside of the capsule for twelve days. In laboratory experiments, cryptobiotic specimens have been chilled in liquid helium to -457°F (-272°C), which is only marginally above absolute zero. In other experiments, tardigrades have also been heated to elevated temperatures, taken on radiation doses that would kill humans, immersed in vats of liquid nitrogen, met with concentrated carbolic acid, hydrogen sulphide, brine and even pure alcohol. And when that was over, they recovered. The tardigrade lineage is ancient. “Tardigrade microfossils are reported from the Early Cambrian to the Early Cretaceous, 520 million to 100 million years ago," said Ralph O. Schill, an expert on tardigrades at the University of Stuttgart in Germany. “They have seen the dinosaurs come and go." There are practical applications to be had from studying the tardigrades. In the future they could help us with protein-based pharmaceuticals that need refrigeration by figuring out how to stabilize them with an eye toward possibly being able to ship them world-wide at room temperature, thereby making the trip to remote parts of the world. Perhaps they could hold the secret to finding out how to develop food crops that can beat droughts? For astrobiology, they may help scientists learn how to expand the scope of life for interstellar travel by using hibernation or suspended animation. Researchers speculate their biological behavior could also aid human colonists in learning how to survive on Mars for long stretches without water. Benson, Michael. Beyond: A Solar System Voyage. New York: Abrams Books for Young Readers, 2009. Book. Smithsonian: How the Remarkable tardigrade Springs Back to Life after Drying Out. Green, Carl R. Spacewalk: The Astounding Gemini 4 Mission. Berkeley Heights, N.J.: Enslow Publishers, 2013. Book. Holden, Henry M. The Coolest Job in the Universe: Working Aboard the International Space Station. Berkeley Heights, N.J.: Enslow Publishers, 2013. Book. Schyffert, Bea Uusma. The man who went to the far side of the moon: The Story of Apollo 11 Astronaut Michael Collins. San Francisco: Chronicle Books LLC, 2003. Book.